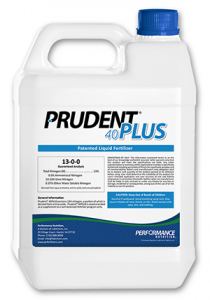 Performance Nutrition, a division of LidoChem, introduced Prudent 40Plus, a highly concentrated phosphite fertilizer fortified with 17 free L-amino acids. It’s formulated with urea phosphite and pennamin amino acids, which are immediately plant-available, and features a lower usage rate than other common potassium phosphite fertilizers, Performance Nutrition said. Additionally, the PO3 stays stable in the jug due to its lower water content. Improves seedling growth and plant vigor. Application on turfgrass and ornamentals calls for 0.75-2.0 ounce/1000 foot2 (1-4 quarts per acre). If using less than 20 gallons of spray solution per acre, do not exceed 1 ounce of Prudent 40Plus per gallon of solution. For ornamentals, begin applications in the spring and apply every seven to 21 days throughout the growing season and spray in the early mornings or late afternoons. For turfgrass, begin applications in the spring and continue on a seven- to 14-day schedule throughout the growing season.